It is Aloha Friday here and the sky is blue! I put together a fun pineapple block yesterday and am posting the pattern and some directions here if you want to put one together too. It has a lot of little pieces that give this pineapple lots of texture just like the juicy pineapples I buy at the local markets. Download the PDF here. 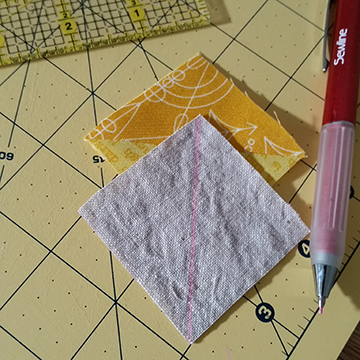 First you will need to know how to put together Half Square Triangles (HSTs). There is a little bit of instruction in the pdf file, but, it is not detailed. 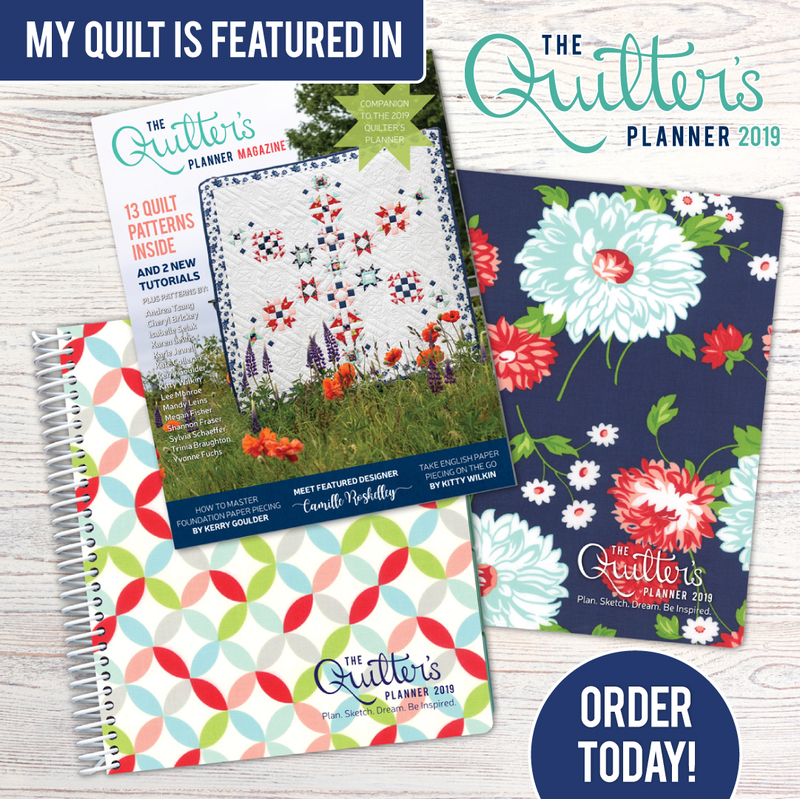 This pattern uses the traditional method for putting HSTs together and I recommend the tutorial at Blossom Heart Quilts. First you will need to put together the dark yellow HSTs by putting together 5 pairs of dark yellow fabrics and creating 10 HSTs. You will take 4 of those HSTs to make the dark yellow/light yellow HSTs. 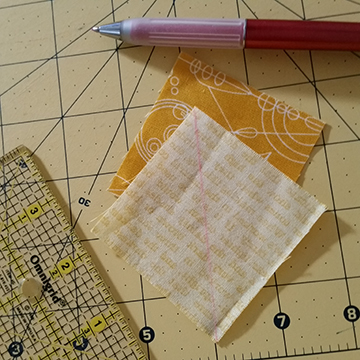 Trim the light yellow fabric to the same size as the dark yellow HSTs. Draw a line on the light yellow and place right sides together with one of the dark yellow HSTs. Make sure to place your drawn line perpendicular to the dark yellow HST. Stitch a 1/4 inch seam on each side of this line. Cut on the drawn line to separate the HSTs and press seams open. Repeat 3 more times to make 8 of these finished HSTs. 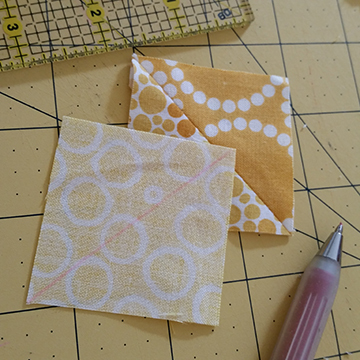 Next you will create 2 light yellow/dark yellow HSTS. 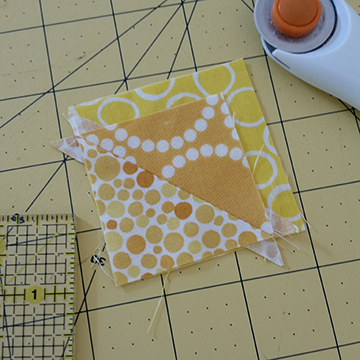 Take 1 yellow square and 1 dark yellow square and create 2 HSTs. 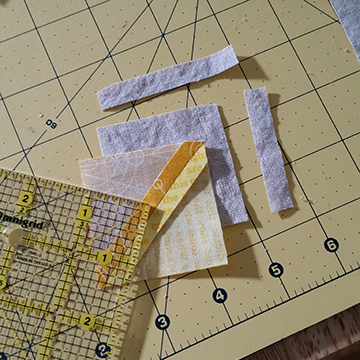 Trim 2 background squares to the same size as the dark yellow/light yellow HSTs. This will make approximately a 2 1/8 inch square. Draw a line corner to corner on the back of the background fabric and align it perpendicular to the dark yellow/light yellow HST with the fabrics right sides together. Stitch a 1/4 inch seam on each side of the line and cut on the drawn line to separate the HSTs. Repeat to make 2 more HSTs. Trim 2 background squares to the same size as the finished HSTs. This should make all your squares approximately 1 3/4 inch. Additionally you will need 1 HST made up of the light yellow and background fabric. Trim to the finished HST size of 1 3/4 inch square. Also take one of the leftover HSTs with 2 dark yellow fabrics and trim to the finished HST size of approximately 1 3/4 inch square. Cut this HST in half on the diagonal to create the top center triangle of the pineapple bottom. Sew the pineapple bottom together in rows on the diagonal as shown in the pattern. 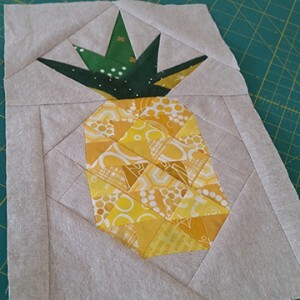 Stitch the triangle pieces to the corners of the pineapple bottom to extend the block out. 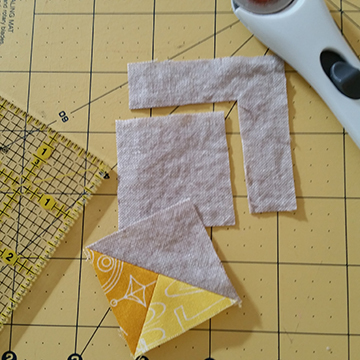 Now you can create the paper pieced top and add the triangle pieces to the corners of it as well. Trim the pineapple top 1/4 inch below the dotted line where it says to attach the pineapple bottom. Trim the pineapple bottom to be even with the top center triangle. Match seams and sew a 1/4 inch seams to attach the pineapple top and bottom. I prefer to press all my seams open, but you can press the seams to what is comfortable for you. ← Fly Aweigh for the boyz….